‘Virality and influencers in digital communication’ – Can the European message go viral? Over the last decade, public discourse has been moved, to a great extent, into virtual spaces. In the empire of social media, influencers and service providers employing algorithms have overtaken up the important role of shaping public opinion previously the domain of the classical (printed and electronic) media. In the current crisis of representative democracy, marked by the perception of a growing distance between the elite and the public, promoting public participation in the European policy-making process is more at stake than ever. Using social media as a new type of stakeholder dialogue and awareness-raising tool is crucial not only for fighting against disinformation, but also for achieving effective communication in support of evidence-based decision-making. It is essential therefore to explore and understand the way viral content and influencers’ techniques work, and to bring scientists, policy-makers and media experts together for an in-depth discussion of the topic. In view of the forthcoming European elections, it is important to investigate how activism and key messages work online, how they motivate and attract people, and to assess their political impact. This is particularly important in the current European social and political context. 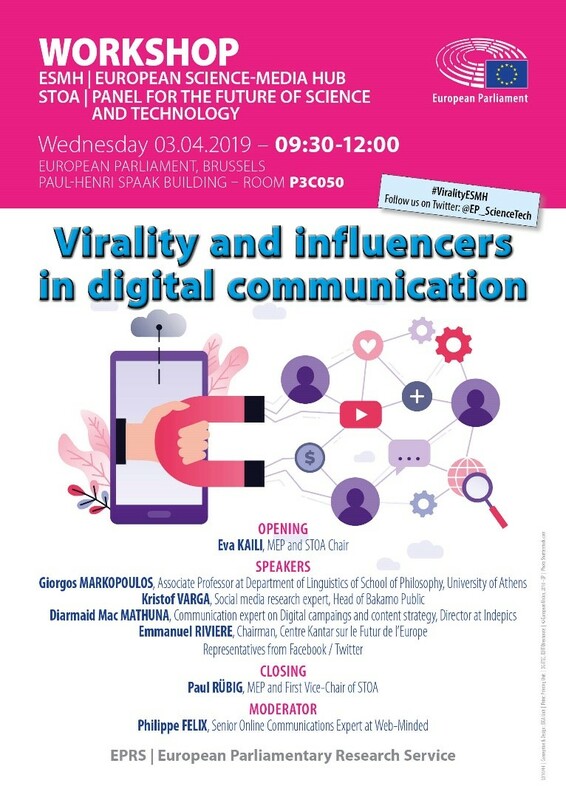 A workshop organised by the European Parliament’s European Science-Media Hub (ESMH) will focus on the role of ‘influencers’ in using modern technologies to increase the number of their ‘followers’. It will look at how technologies can carry and amplify messages, becoming ‘viral’, and the type of communication used. The event will also explore the ‘eco-chamber effect’ in communication within modern societies. Besides the technological aspects, the workshop will also employ social science considerations to deal with the psychological aspects of ‘viral media communication’ and its social impact, with particular attention paid to political influence, e.g. the ‘yellow-vest’ movement. The idea is to explore whether we can use a social media communication methodology, going beyond keywords and sentiment, and looking at the full social discourse, to understand the broad themes that attract and motivate people to join the conversation and gain insight into their behaviour. The workshop will feature discussion between various experts in the fields of communication technologies and social sciences on the ‘science of virality’. It will also include communication practitioners involved in past electoral campaigns and social media representatives in a session on the ‘practice of virality’. The event will be moderated by a senior online communication expert. Besides the workshop, the ESMH will also perform and compile interviews of the speakers as part of an ‘event report’ to be published on its website. The event will take place on 3 April 2019, just fifty days before the next European elections. It therefore provides a very useful occasion to reflect, exchange and debate on the topic among Members of the Parliament and the other participants, especially on how the European message can be conveyed more effectively. In fact, ‘influencers’ and ‘viral content’ can also pose a threat, a challenge, as well as an opportunity to pass positive messages. The ESMH, in its role of a promoter of sound science communication, is ideally positioned to inform the Members of the Parliament and other related and interested actors about the topic. The subject is also relevant in the framework of the current discussions on the role of new media in relation to big data, analytics and artificial intelligence (AI), such as those that took place in the context of the European Parliament resolution of 12 February 2019 on a comprehensive European industrial policy on artificial intelligence and robotics. It also bears on a number of recently published or ongoing STOA studies, especially those on algorithmic transparency and accountability, polarisation and the use of technology in political campaigns, and regulating disinformation with AI. To keep up to date with this workshop and other STOA activities, follow our website, the EPRS blog, Twitter and Think Tank pages.